Peel the skin of cucumber chop into small pieces. 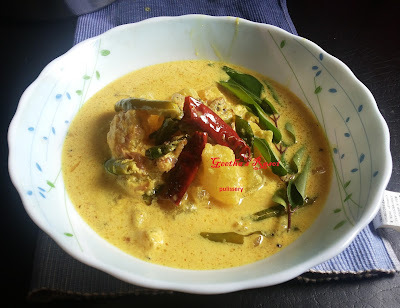 Then cook this with turmeric, salt and chilly powder. Grind grated coconut with green chilly, jeera into fine paste. Whip the curd and add the ground masala and mix well. Pour this on cooked vegetables and boil for few min. Heat oil in a pan add mustard seeds, methi seeds, red chilly, chopped onion and curry leaves fry till brown. Pour this on boiling curry. Pulissery ready to serve.